Wow - now that's a masterpiece! 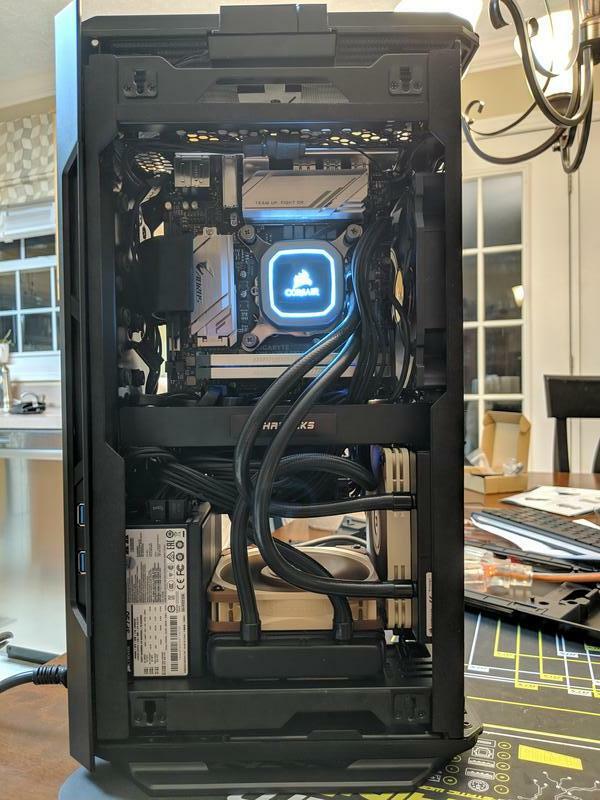 Feels good to get a build dialed in, doesn't it? See what I mean about it being wrong in YouTube videos? Now you know what it takes to get a high-end ITX build right! 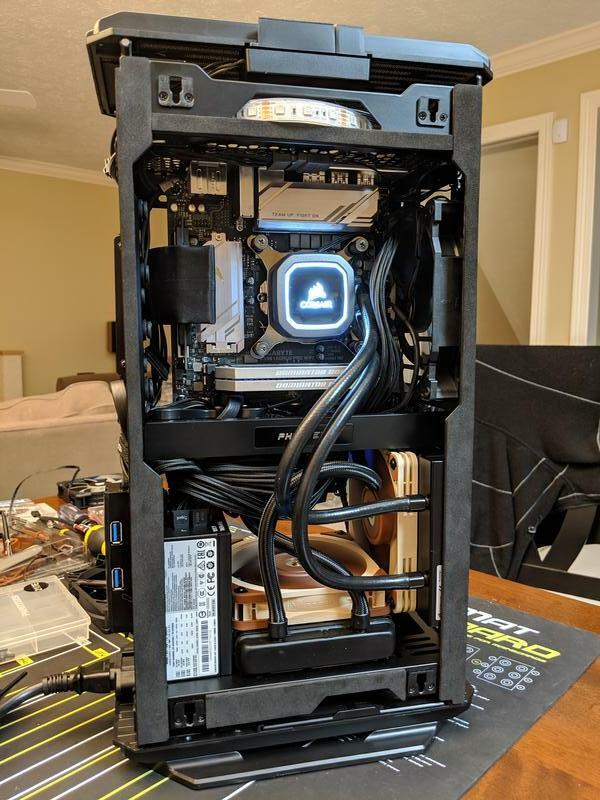 Your GPU is going to be ultra-chilly with this setup, but keep an eye on CPU temps. There's a slim chance you might need to swap the radiators to give the CPU cooler an extra boost. By the way, how did you connect the fan power cables? 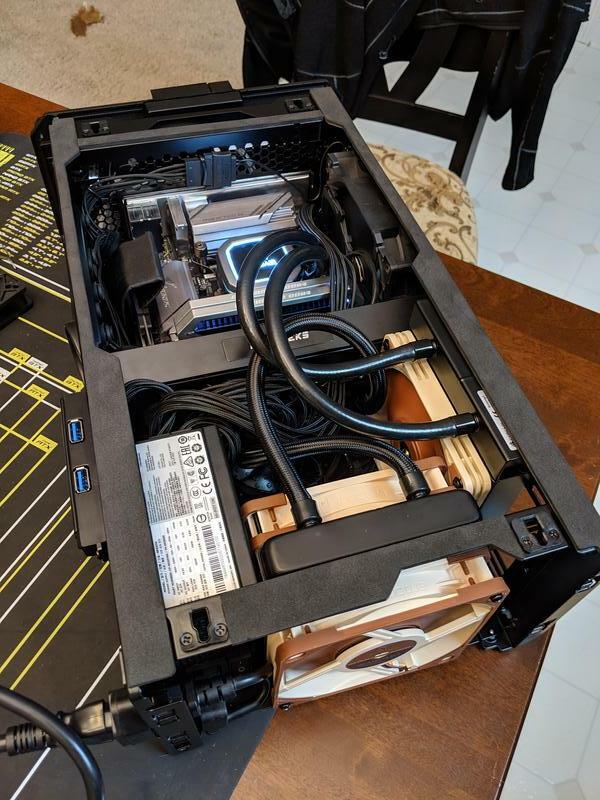 Noctua uses 4-pin connectors, so I assume you don't have the GPU fans connected to the GPU itself. 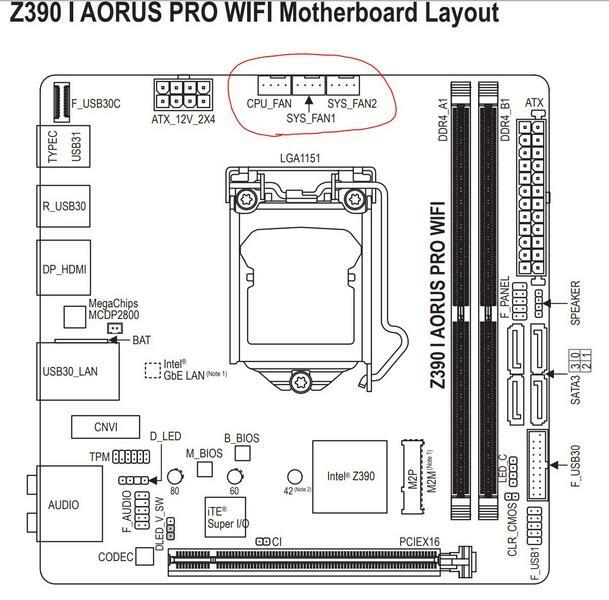 And are you using y-connectors to the motherboard header? I just want to give you one word of warning: controlling GPU temps when a fan is connected to the motherboard is tricky. The motherboard ramps up speed based on CPU temp, which isn't always a good approximation of GPU temps. I just installed a Corsair 3-pin fan on my GTX 1080 Ti Hybrid radiator specifically because I just couldn't get it under control when using a 4-pin fan connected to the motherboard. It's much better now. 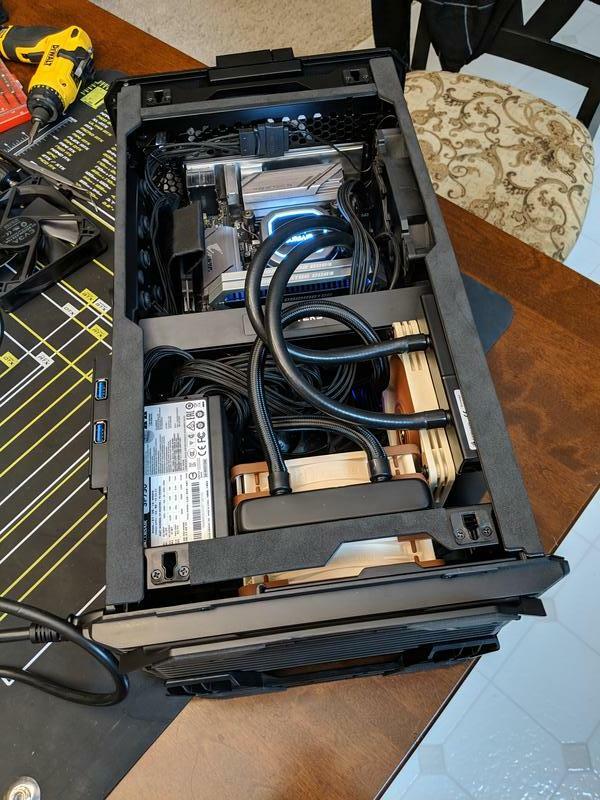 Because you spent good money on those Noctua NF-A12x25 fans (like premium money! ), you should hold onto them, and maybe opt for these 4-pin-to-3-pin adapters. Haha, I wondered when you would ask about the fan configuration. The short answer is that I bought a variety of fans, hooked everything together, and crossed my fingers. Everything spins, at least. - on CPU_Fan header, I have attached the single-pin tachometer lead connected to the Corsair Hydro CPU cooler pump. Now that I thibk about it, I need to make sure that that tach is on the PWR pin and not the GROUND pin. Presumably, I can figure that out without opening the case via software -- one of the temperature monitor apps I have been using should be able to report tach speed, right? - on SYS_FAN1 header, I have attached the 3-pin lead connected to the slim CPU Noctua fan (also a FLX model), which is mounted to the Corsair radiator. Presumably this will run continuously. I do have the option to attach a 4-pin slim PWM Noctua fan to the Corsair radiator, but since the Hydro came with a 3-pin fan, I assume that this means that the Corsair H60 cooler fan was designed to run continuously, rather than using PWM, so I kept it that way when I swapped out the fan. What do you think? Do I need to reorganize any of that? It was a late-night project and my head was only half in it. I do agree that I will need to keep an eye on the CPU temp. I was looking at that last night -- the CPU is now using a single, slim fan and that fan's airflow is just ever-so-slightly blocked by the GPU fan beside it, so it can only move so much air through the Corsair radiator, which was designed to work with a different fan. Does your EVGA GPU have a 4-pin header coming off the PCB? If so, that's a change from the 1080 Ti Hybrid I'm working with, and it's an improvement overall. 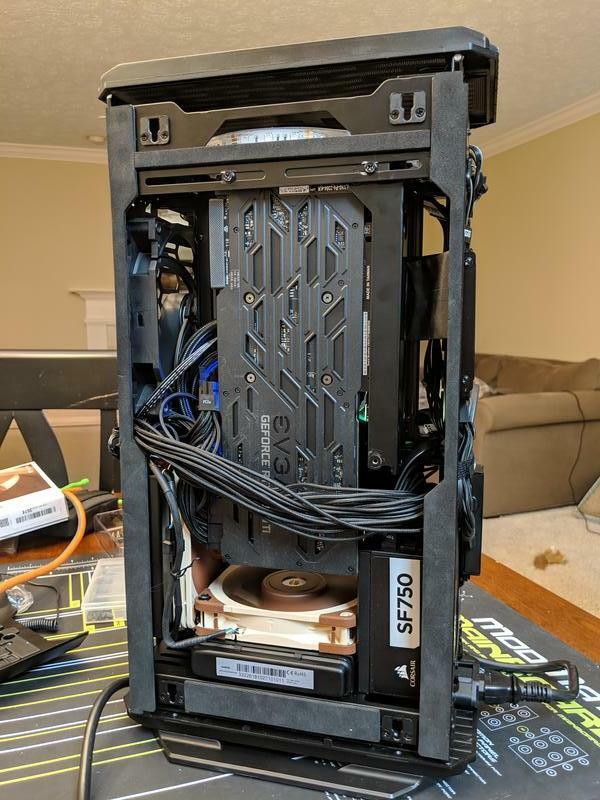 Too bad those two 25mm fans have different connectors. I'd actually suggest you plug the 4-pin model into the end of the splitter with just 3 pins, and here's why: it will probably force the system to control the fans by DC control, which is a less precise alternative to PWM. But it still gives you control. With the 4-pin fan connected to the 4-pin end of the y-splitter, you're going to lose all control over the 3-pin fan if running PWM controls. The missing pin isn't for PWM, it's for tach - you don't need two tach readings when both are supposed to be running at the same speed. As for the slim 3-pin fan on the CPU radiator, you'll want to make sure you switch to DC control in the UEFI. You don't need that fan running at 100% all the time. On a related note, I checked my own H60 (2018) sample, and it uses a 4-pin fan, which is what I had remembered. It would be odd if Corsair made an undocumented update to the SKU, but it could be because they released new fans soon after the cooler was released. 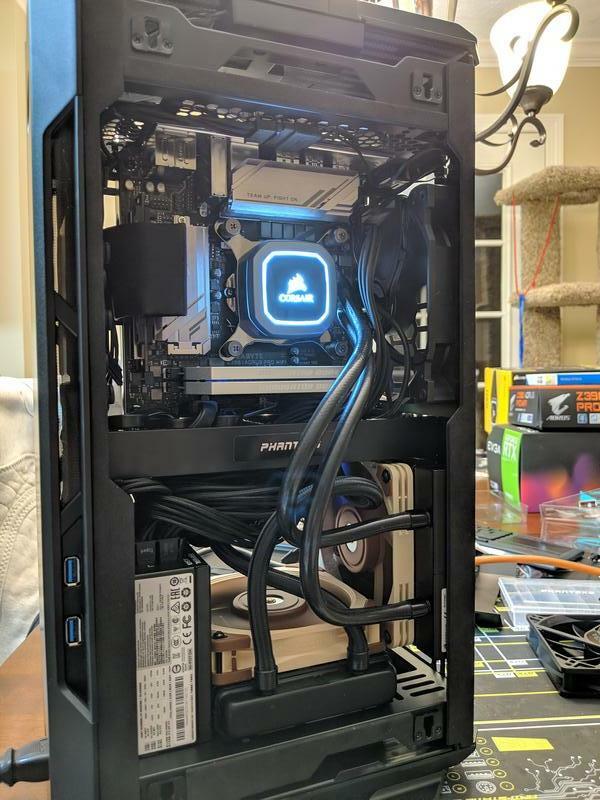 Can you provide a photo of the Corsair fan? Did I mention that I was tired when I did the new fan installation? Lol, you were right, the Corsair H60 was indeed a 4-pin fan. The good news is that when I ordered the 3-pin Noctua slim fan to replace it, I ordered both 3-pin and 4-pin versions of that fan, and the 4-pin version is arriving today. I just checked and I can confirm that the graphics card does have a four pin connector. 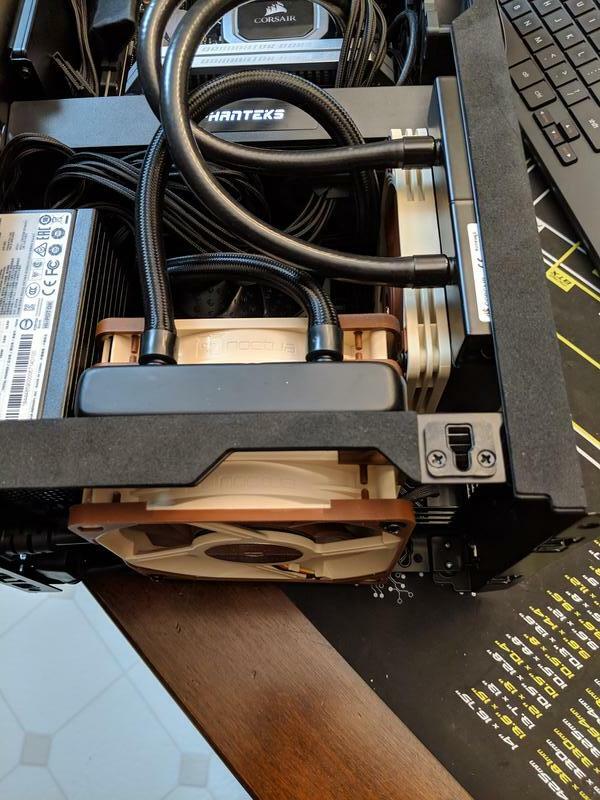 As noted previously, I have two 25 mm width fans connected to it, one a 3-pin Noctua and the other a 4-pin Noctua. Would I be better off just making both of those GPU fans four pin fans? I'm going to have to tear everything out anyway to get to the slim CPU fan, so I can replace the that 3-pin GPU fan as needed. I don't necessarily even need to order a replacement fan for it, because the EVGA fan that came with the graphics card is a four pin. 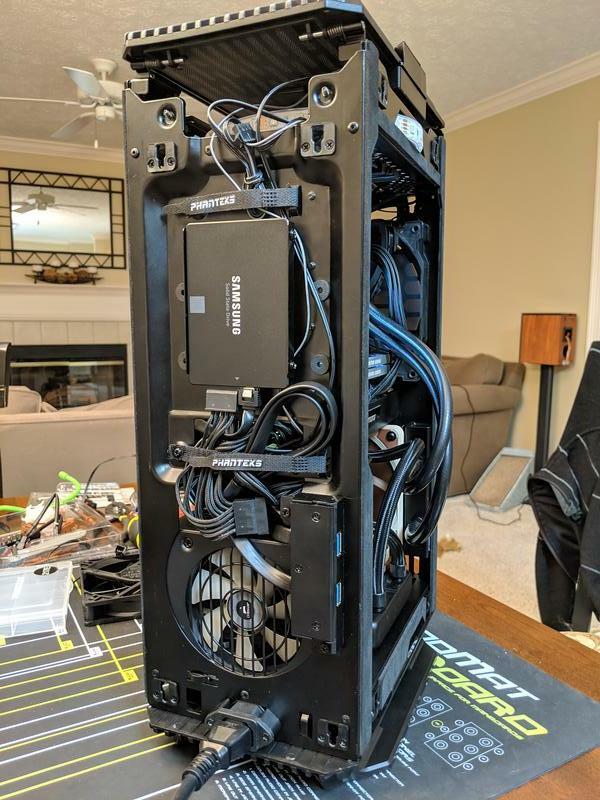 You've become a true fan collector - I'd love to see an inventory of all the fans you have for this build! Good to hear the graphics card has a 4-pin. That being said, I'd probably just run the Noctua 25mm fans on 3-pin control, because they are much better than the Corsair fan, and mixing two different fans on a single splitter leads to loss of fine-grained control, since they aren't matched in terms of RPM. The signal might be "75% PWM", but one is spinning at 2000RPM and the other is at 1200RPM. If you want to run PWM control off a splitter using the GPU header, you'll want matched Noctua 4-pin fans... want to add another to your collection? Good fans never die, so you'll have these for the next project. I still occasionally pull out some great fans I've had since around 2006! Right on. Amazon was super fast -- I ordered an additional fan yesterday and it arrived today. I put it all back together and did a ton of stress testing with different apps. CPU and GPU temps are staying below 60°C in the cabinet, so that's great news. Of concern, however, is the 1 TB nvme drive. It's hitting 85°C when stressed. I realize that those drives like to be warm and it will throttle itself down if it gets too hot, but still -- that is pretty warm. 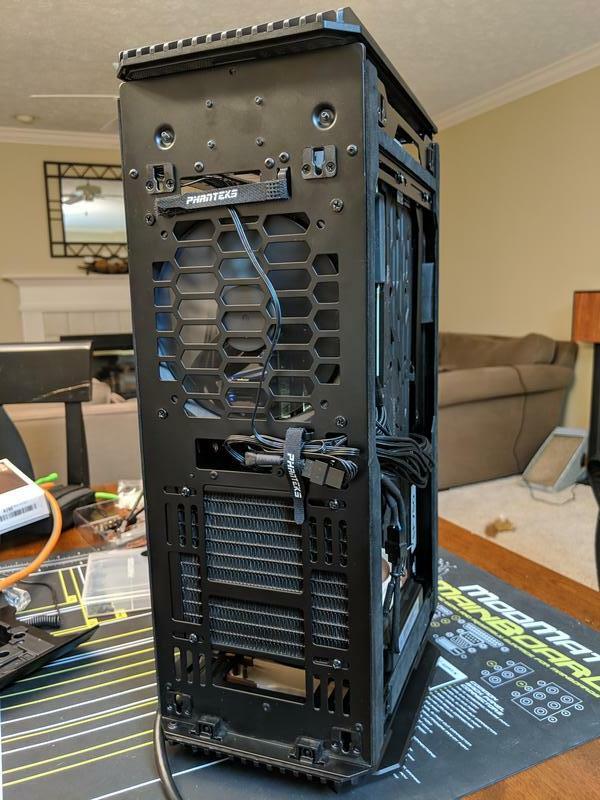 It does have a mb-provided heat sink and the one case fan does blow across the mb in its general direction, but they don't seem to be helping much. Yeah, that's hot, way too hot for an SSD. So hot in fact that I don'awt think that reading can be right. What I'd do is try a few different monitoring apps (hwmonitor, hwinfo, etc.) to check the temp, and if it stays that high, remove the heatsink and run it that way, again checking temps and touching it with your finger. 85C would like burn your finger, so be careful, but again, I don't think that can be right. Highest I've ever seen is 55C and that was with a lot of hot air from the video card being exhausted right on the SSD.